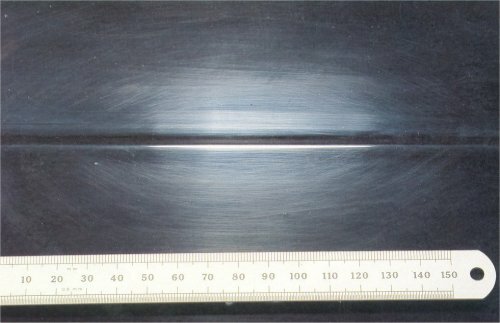 Microgrooves or smears on the surface of the film, typically in a curved or swirling pattern. Underlying layers may show through. a) Compounding or polishing the surface before fully hardened. b) Excessive pressure or speed of mechanical polisher. c) Use of too coarse or ammoniacal compound or incorrect polish, dirty or coarse polishing cloth or mop. a) Allow surface to harden fully before compounding or polishing. b) Use mechanical polishers at minimum pressure and correct speed. c) Use the correct grade and type of compound and polish, ensure polishing cloths or mop are soft and clean. Allow the surface to harden fully, flat compound and polish. In severe cases, flat and repaint the surface film.